Dental care can be a real challenge if you are living with multiple sclerosis (MS). Not only can spasticity and tremors make it difficult to coordinate the fine movements needed to brush properly, the fatigue and pain can sometimes sap you of the will do so. As a result, people with MS often neglect their oral health. The tendency to focus on MS-specific needs can place other health and wellness issues to one side, causing long-term problems that only serve to complicate the disease itself. But the concerns are not just about dental habits. MS can affect the teeth and gum on a biochemical level as can certain medications used to treat the disease. This can make oral care far more challenging than many—including those living with the disease—may realize. People with MS are at an increased risk of cavities and gum disease due to both the physical effects of the disease and the deterioration of the immune response. As a result, people with MS tend to have more extensive gingival disease and a greater number of decayed, missing, or filled teeth than people in the general population. 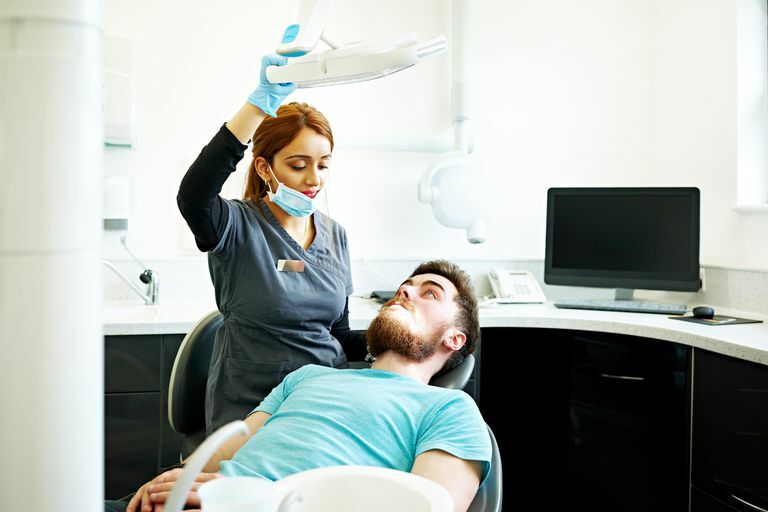 Moreover, as MS and periodontal (gum) disease are both associated with inflammation, there is something of a cause-and-effect relationship that can make both conditions worse. The build of plaque, for example, can lead to periodontitis (a serious form of gum disease) which, in turn, causes inflammation that can trigger a flare of MS symptoms. When this happens, the inflammation caused by MS triggers the release of chemicals (including endotoxins, cytokines, and protein toxins) that penetrate the gum membrane and cause gingivitis (gum inflammation). If this cycle is allowed to continue, both a person's dental health and general health can suffer significantly. Each of these can add to the burden of oral disease by making it difficult and even painful to brush. Moreover, the lack of saliva caused by dry mouth is directly linked to dental problems. Saliva is important to oral health as it helps to wash away food debris, reduce plaque, and inhibit the growth of bacteria. Without these effects, severe tooth decay and gum disease can develop. In fact, 30 percent of tooth decay in older adults can be directly attributed to dry mouth. Dental care is about more than just teeth. Good oral hygiene can influence your health and significantly reduce your risk of symptoms if you have MS. Central to this, of course, is scheduling routine dental visits every six months to better assess the state of your teeth, gums, tongue, and throat. Everyday habits should encompass twice-daily brushing (after breakfast, before bedtime), daily flossing (before bedtime), using a fluoride toothpaste, eating a balanced diet, and avoiding excess sweets. To deal with fatigue, sit in a chair when brushing instead of standing up. Floss in bed to ensure food debris is removed just before bedtime. Wrap foam around the toothbrush handle to give yourself a firmer grip. Always use a very soft toothbrush. Manage hand tremors by wearing weighted gloves. Consider an electric toothbrush (but avoid those with a circular motion which can be harder to control and opt for one with a vibrating head). If you have dry mouth, use a specially formulated mouthwash such as Biotene Dry Mouthwash or ACT Dry Mouth. Chew sugarless gum to help stimulate saliva. As a friend or family to brush if you can't do so yourself. If brushing is not something you can manage as well as you would like, ask your dentist about prescribing a toothpaste with prescription-strength fluoride or a remineralization paste like Recaldent to support your daily routine. An over-the-counter fluoride mouthwash can also help. Modern dentistry is no longer about the mouth and teeth alone. It is about how oral health relates to and affects the body as a whole. Whether or not you have symptoms of MS, it is important to advise your dentist of your condition (or any other medical condition you may have). This can help the dentist better understand your needs and tailor treatment more in line with your specific concerns and/or limitations. Elemek, E. and Alma, K. "Multiple sclerosis and oral health: An update." The Dental Assistant. 2014; 83(5):32-39. Little, J.; Falace, D.; Miller, C.; and Rhodus, N. (2013) Little and Falace’s Dental Management of the Medically Compromised Patient (8th ed). St. Louis: Elsevier.